I took a look at previous postings and almost went into diabetic shock just reading about all the sugar! I thought I might fix that with a savory recipe. It's warm and delicious. It can feed a few or a lot of people (very easy to multiply). And if you like spicier foods you can always kick this up a notch. 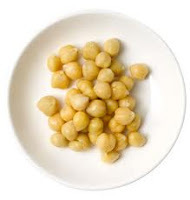 It's Chorizo y Garbanzos! - 1 T olive oil, garbanzo beans and onions into saute pan - medium heat - until garbanzo's start to brown. Remove from pan. - 1 T olive oil and the chorizo, cook thoroughly. 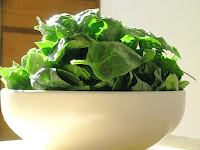 - Turn down heat and add fresh spinach leaves and cover until leaves have wilted. -Serve with a sprinkle of bread crumbs on the top. And it'll leave you craving it again and again. 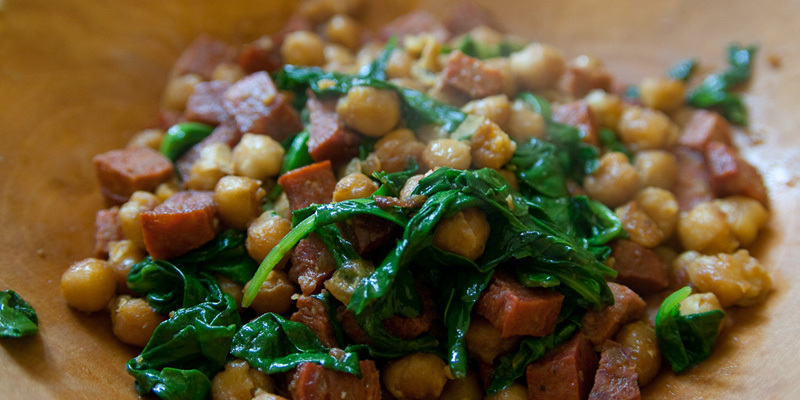 This sounds so great :) Sometimes it's hard to find chorizo in my supermarket, but I'll have to keep an eye out for it! Understandable. I'm also very picky about my chorizo. 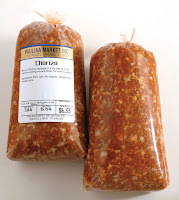 I bought a brand once (in similar packaging as above) that was full of gristle and bone shards - not a good experience.